Limestone is an organic sedimentary rock composed of different crystal forms of calcium carbonate, primarily calcite and aragonite. The presence of calcium carbonate, much like marble and travertine, makes this stone sensitive to acids, and it is therefore highly susceptible to etching. Calcium carbonate also gives limestone the ability to be polished in a way that creates a beautiful shine. Limestone is considered a soft stone that is highly porous, making it an easily stained surface. Frequent maintenance is required if limestone used in highly trafficked area, and it will need to be sealed and maintained periodically. Fortunately Concrete & Marble Transformerz has extensive experience with limestone, and we can effectively repair scratches and etching. We use sophisticated stone restoration techniques that won’t damage your limestone. Because limestone is such a sensitive stone, we will provide you with a future protective treatment strategy as well! Contact Concrete & Marble Transformerz today for a no-cost estimate! 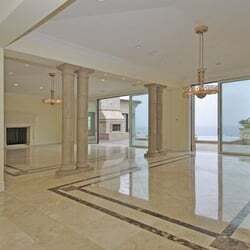 Our work ethic is unparalleled, and we’ve helped hundreds of families in Long Beach, Redondo Beach, Los Angeles, and Orange County with their stone restoration and stone polishing needs.